June 2018 63 The Evangelical Lutheran Good Samaritan Society was founded by Reverend August Hoeger in 1922. The Society opened its first home opened in 1923 in Arthur, North Dakota. Today, the Society asserts it is the nation's largest nonprofit, owner-operator of senior living facilities. A paper published in Distributed Diagnosis and Home Healthcare in 2006 reported the Society employed over 24,000 people, operated more than 250 facility locations in 24 states and served some 28,000 residents. 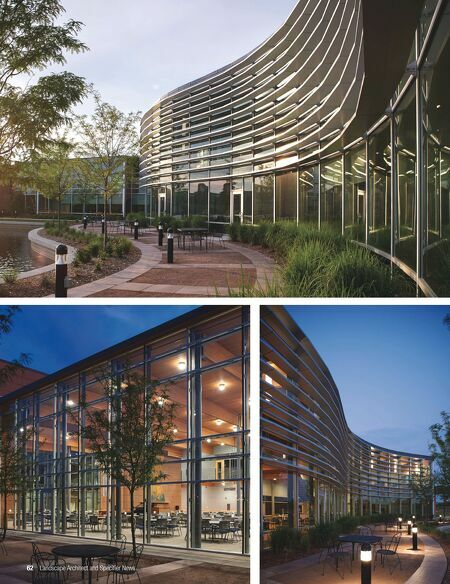 The recent expansion and updates for the national corporate campus headquarters of the Good Samaritan Society in Sioux Falls, South Dakota provide a beautiful, functional and relaxing environment for the organization's staff and visitors that integrates the campus architecture and other existing amenities. This 2015 project expanded and updated a campus that began in 1989 with the purchase of a former bankcard processing facility. The site's first campus expansion occurred in 2001 with additional facilities that would provide a retreat and training facility for the leaders of the organization's workforce. With the needs of the Good Samaritan Society's facility changing and growing to require major facility and grounds improvements and expansions. The Society's desire for a staff centric yet efficient work environment, along with a declining need for the retreat facility due to advances in communication technology as well as staff growth, gave rise to the need for campus additions and renovation. The project adds 90,000 square-feet of office space for 400 staff on campus and improves the grounds conditions for a workforce that is encouraged to spend time outside together in a neutral and relaxing environment, and at times, to reflect at one of the many secluded spaces or walking trails around the 30-acre campus. Starting with the master plan, Stockwell assisted the owner in re-envisioning the outdoor campus to integrate elements along a looped trail. Along the trail, users come across a secluded prayer garden centered around the statue of Jesus provided by Reverend A.J. Hoeger Sr. They will also find an outdoor amphitheater overlooking a central reflecting pond. Large native stone quartzite blocks retain earth across the sloping lawn, while creating seating for employees during the weekly chapel gatherings. Quartzite blocks also frame the main "performance area" that has been filled with pavers engraved with the names of past employees, giving patrons an opportunity to leave their physical mark and history on the site The project adds 90,000 square-feet of office space for 400 staff on campus and improves the grounds conditions for a workforce that is encouraged to spend time outside together . . . The Ryan Building patio at the Evangelical Lutheran Good Samaritan Society Headquarters in Sioux Falls, S.D., overlooks a central pond. The 42" LED matte black finish bollards provide ambient light for the patio. The hardscape is decomposed granite and quartzite bordered with 2'x 2'x 2" quartzite pavers with a flame finish. The pavers directly link to every other column in the building façade. 'Shademaster' honeylocust trees bring afternoon shade. 'Prairie Purple' coneflower, 'Pardon Me' daylily and ornamental grasses ('Flame' grass and 'Blues Little' bluestem) soften the edge of the pond's retaining wall. 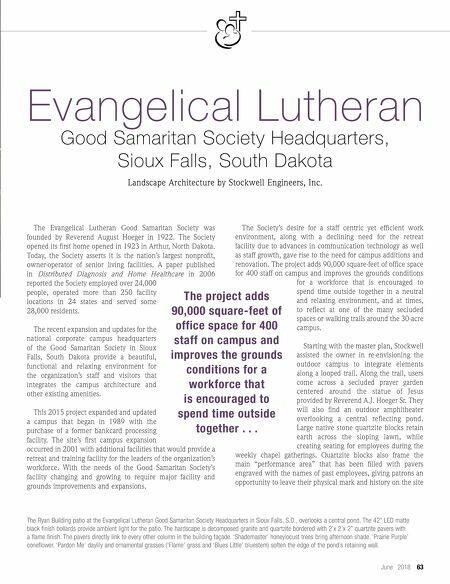 Evangelical Lutheran Good Samaritan Society Headquarters, Sioux Falls, South Dakota Landscape Architecture by Stockwell Engineers, Inc.